The first thing you see when Linux Mint 18 starts to boot is a countdown. If you leave your computer untouched for 10 seconds the default Live boot will start. Otherwise you have a small menu where several more options exist. Apart from the "standard" option to go for a direct install, Linux Mint 18 offers you an opportunity to run an installation in "OEM mode". This allows you to install and configure Linux Mint 18 on bare hardware, then turn it over to a new end user who can create a new unique identity, password, location, etc. I have not tried it myself, so all comments on that option are welcome. Once the boot sequence starts, you see a Linux Mint logo in the middle of the screen. Soon after that, the default Cinnamon desktop appears in front of you. The default desktop is very familiar to many Cinnamon users. There is a panel at the bottom of the screen. The panel itself is dark-grey. It features the menu button with Linux Mint logo in the left corner, shortcuts to Firefox, Terminal, File manager and "Show Desktop" next to it. The right part of the panel contains a notification area with clocks, list of windows, battery, volume and network control indicators. There is also a user menu that allows you to switch off the computer, switch user or go into the System Settings. The middle part of the panel has buttons for current open windows. There is no switch between the virtual desktops on the default panel, but you can add it by right-clicking the panel and selecting "Add applets to the panel". There are some icons on the desktop: shortcuts to Computer folder, user Home folder and Install Linux Mint. 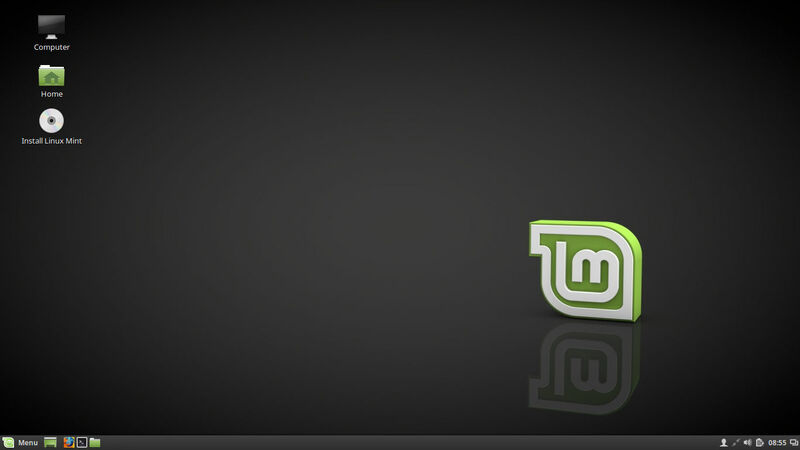 The desktop itself has a dark-grey wallpaper with Linux Mint logo in the right part. Though previous versions of Linux Mint contained the version number on the wallpaper, Linux Mint 18 does not have this number on the default image. If you don't like this picture, you can choose from about 25 alternatives split between the "Linux Mint" and "Sarah" categories. The former contains Mint-themed images and the latter gives you a choice of nice photos. The freshly booted operating system took more than 465 Mb memory. That is probably OK for a laptop with 4Gb memory on board, but still is way too much. Just compare it with 360 Mb of Ubuntu 16.04 MATE or 320 Mb of Xubuntu 16.04. Linux Mint 18 experienced no issues in recognising and configuring the wireless network card of my laptop. Few clicks, typing in the password, and I am connected to the network and Internet. Unfortunately, I wrote this review away from home and could not test the options to connect to the network drive that I have. Linux Mint 18 Cinnamon uses version 3.0.6 of Cinnamon Desktop Environment. There were some changes in the way you configure keyboard layouts in this DE version if you used previous versions of Cinnamon. This setting was moved from the Region&Language part of the Settings Panel to the Keyboard part. There is no more item called "Region&Language". Another difference is that you can no longer switch between the flag and text representation of the current layout in the panel. You need to do this via a separate window that appears when you select the Configure option while right-clicking the panel item. The rest of the process remains the same - you can check in in the article I wrote some time ago. It will also be updated soon. Linux Mint 18 Cinnamon comes with a decent set of applications right out of the box. Firefox 47 is default and the only browser in this operating system. On top of it, there are Thunderbird email client, HexChat, Pidgin instant messenger and Transmission torrent client in the Internet section of the menu. The Office section of the menu sports the full set of LibreOffice 5.1.2.2 tools, including Base and Math, plus Document viewer. There are several applications in the Graphics section of the menu: GIMP, Image viewer Xviewer, Pix manager and Simple Scan. The Multimedia section of the default menu contains Banshee media manager, Video player, Brasero disk image writer and a separate item called Install Multimedia Codecs. We'll come back to that topic in a moment. Of course, there are plenty of small and nice utilities for the everyday and one-off tasks like Xed editor, Calculator, Archive manager, Backup tool and so on. If you are not satisfied with the set of applications you have out of the box, you have Software Manager to deal with that. All the Mint and Ubuntu repositories and PPAs are available for you. As I have already mentioned in the quick screenshot tour through Mint 18 Cinnamon, this operating system no longer comes with the tools necessary to play multimedia files. You need to have Internet access to install these codecs. Moreover, an error appears when you try to install these codecs. You can see that error in the previous article. As a result, Firefox still could not play back the Adobe Flash videos, while MP3 files played successfully from the local drive. Some local video files also played well, while others still had issues with playback because AAC audio codec was not installed. 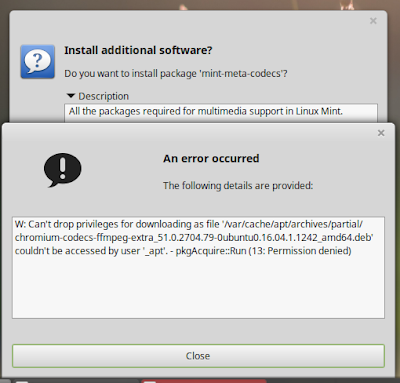 Linux Mint suggested installing more codecs, but even that did not help. Video player showed the video part of these videos files, but the progress line remained at the 0:00 point and there was no sound. I could say that Linux Mint 18 Cinnamon is a nice and easy distribution everyone can use... I could, if there was not the issue with multimedia codecs. That spoon of tar spoiled the whole barrel of honey. The error with the installation of multimedia codecs well may be a result of my running Linux Mint 18 Cinnamon in Live mode. But that error was not there before, in previous Live versions of Linux Mint, mainly because all necessary codecs were already pre-installed. 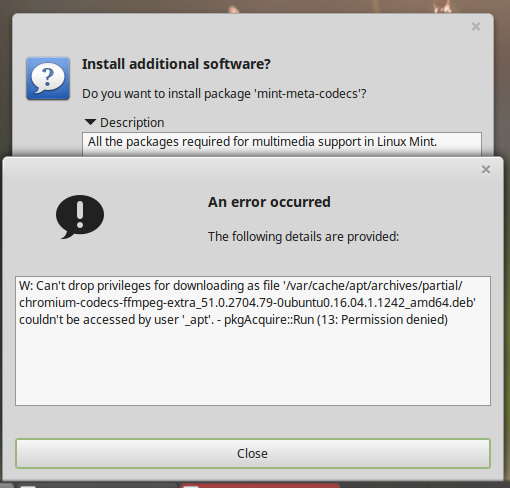 The Linux Mint team introduced the error by changing the way codecs are distributed. I cannot guarantee the users wouldn't get a similar error in the installed system, and thus I would not recommend installing this operating system, especially for novice users. For me, Linux Mint 18 Cinnamon edition lost its benefit of the system everyone can use in a simple "plug&play" mode even from a Live media. If you want to try Linux Mint 18 yourself and check the above yourself, why not order a disk with this operating system through BuyLinuxCDs.co.uk site? To my mind it is a pity that more users do not look at Korora. It has all the plus points of Mint but being based on Fedora gives you constant tested updates and a stable base. It offers most desktops and I amusing KDE version on my desktop and Mate version on an old laptop, Perhaps you could give it a review. Thanks for the idea, Bernard! Nice overview of the release, codec issues aside. The codecs issue is probably a "CYA" solution to prevent the belligerent thugs in the US entertainment and software industries from trying to block it from distribution here. Thanks to your easily-bribed Congresscritters and abominations like DMCA, you are not allowed access to your own paid media. Don't like the lack of codecs? Don't complain to Mint, complain to your congressthug. I don't live in the USA, I don't care about your congressthugs. Actually it is led by a French man living in Ireland, and has a development team who live all over the world. I have time 3 years to find something else. Do you hope it will improve in 18.1, 18.2 or 18.3? No, I don't think it will improve. Since they are an important distro they care less about many things and as you saw Cinnamon 3 looks uglier than the previous version. FYI der, it did improve in 18.1. I've had no issues with the Mint 18 release, and the codecs installed without problems during the installation process, including x265 libraries. Flash plays in the browsers and HEVC videos work out the box. Jim, codecs were in the ISO image in all previous versions. Why does Mint team want to create havoc in additional step during the system setup, and make the Live system useless? Probably because they got tired of being criticized all the time for including the codecs in the installation in the first place. And since the US and the EU are constantly tightening down on "digital rights" and such, the Mint developers probably finally had enough. Possibly they don't want to waste most of their remaining life in courtrooms. But in any case, after I installed it to my HD with "Include 3rd party drivers" (or somesuch) option selected, I have had no problems. I don't think it's fair to have the overall conclusion of your review hinge on the fact of whether one is able to install something in a live session, something a live session is not even ment for. If you read other reviews of Mint 18, you'll find that installation of the codecs, either during or after installation works flawless. Yes, this complaint seems petty, certainly a multimedia codec problem in a live session is not enough to throw Linux Mint 18 to the curb over. Do you want more complaints? I have them! Ah yes, I read that review. One particular laptop with fidgety hardware. But I have also read raving reviews of people who had no problem whatsoever with Mint 18. Personally I'll stick with 17.3 KDE for the time being. 18 ships with KDE Plasma which I don't to appealing. I'll stick with good ol' KDE 4. I totally agree with Menno as I too will remain with Linux Mint 17.3 KDE. There is no sense in updating to 18 as the Linux Mint KDE version will be using Plasma 5.5. No thanks! We are already up to Plasma 5.7.1. Sadly even this release is bug riddled. It's clear to me the KDE 5 desktop still needs more time in the oven. I have no doubts it will be a great desktop ..... just not right now. I agree. I've installed both 18 and 18.1 with no CODECs issues. The "live" install is meant to verify the installation will run on your machine, and to explore the basic O/S features. It's not meant to be a "temporary" complete installation. I guess its not the best solution, but I do "upgrades" and avoid fresh installs only because sometimes the desktop and applications are setup and customized a certain way, and so far? I've only had ONE upgrade go sour, (from 14 to 15) but since then?...none of the upgrades I've performed have broken anything or caused any headaches. Speaking from a fresh install aspect I try to always have the internet connected to improve my chances of the install going successfully. And since most of the people I know who use it most likely got it FROM me?...then they're pretty much setup to get their updates and if they ever have a problem (the type that causes a complete do over!) they're usually the first to call me, to which case I always...always.....ALWAYS: Backup and (If Need Be) re-install. Easy as pie! LoL! i just installed mint 18 cin on a asus t300chi so i could finally ditch windows 10. I'm in canada and all codecs were installed and no error messages. Location must be an issue? Wesley, have you tried to install codecs in Live version? I have. Just ignore the warning messages by clicking OK on the dialog boxes and the install will proceed. I have done this many times on the live version. Kenneth, it obviously didn't work for me. Frankly, if the need to install codecs by clicking a single item selection during installation is all that you can find wrong with Linux Mint 18, that sounds like an endorsement. I installed Mint Cinnamon on my laptop and have no issues. Like pretty much every previous version of Mint, installation was easy and everything just works. If you're looking for a reason to dislike it, I guess having to go to all the trouble of clicking one new item during the easy installation can be your choice, but if that's it, that one thing, deeming the release insufficient for that strikes me as petty choice, not reasonable evaluation. -- Mike C.
The previous versions of Mint had no need to tick that checkbox. Moreover, you could use it fully functional in Live session. I had a "business case" for that. No longer possible in this version. "Until now our release cycle consisted in the production and testing of 18 ISO images (4 Beta, 8 Stable, 2 OEM and 4 NoCodecs) and 5 separate events (Beta, Cinnamon/MATE Stable, OEM/NoCodec, Upgrade path, Xfce/KDE). This represented a formidable amount of work but although some of it greatly contributed to making Linux Mint better, some aspects only marginally improved things. For instance, our QA process, BETA releases, and the feedback we get from them are invaluable and they are key in the quality of our distribution. Upgrade paths which were introduced in Linux Mint 17.1 are also very appreciated. In contrast, although the absence of codecs is important for magazine and distributors and OEM installation images are required for manufacturers to pre-install Linux Mint on computers they’re selling to their customers, this is an area where a lot of work is done for a very small portion of our audience. This will reduce our release cycle to 4 separate events and the production and testing of 12 ISO images." Ah, yes, I read that nonsense. "We are too busy and too lazy to make some more images. 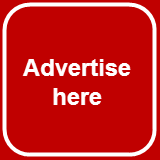 Let's sacrifice the selling point of our distribution in favour of handful of OEM installers." Yes. I had to check whether this crazy docking station worked in mint as it did under windows. the other distros i tried i couldn't make the screen fit but mint has a selection to make the screen items "double" in HD. Worked perfectly after installed. I've used every version of Mint from 6 on. Never any problems at all... an astounding track record. I settled for XFCE for awhile, though recently I've ditched the desktop altogether for the Openbox window manager and Tint2 panel. Couple the above with a good SSD and you have a blazingly fast machine. I use the same setup at home and at work - my old Optiplex 780 runs circles around everything else in the office. Write another article when you've actually installed Mint and I'll be sure to read it! I don't plan to install Mint 18 on my machine. Would you prefer to write such article yourself? Absolutely not... I will leave that to experts such as yourself. I see, it's easier to criticise the author than be the author. Lol, 465Mb is too much :) And then you open Chrome and it takes 2Gb with 10 tabs open. You just while installing it, click on 'install codecs' and that's it, music and works. Write how 'usb write' app work awesome or 'usb format'. I use Kubuntu 30 min. and 5 apps crashes. Using Mint a week, njet, nada, nights, zero crashes. With my wifi it works perfectly and with my Android also. Sorry dedoimedo, not everyone has your wifi and win phone access problem. Mint18, best Linux D intro so far. I'm not Dediomedo. And I wrote about Live version of Linux Mint with its issues. You probably were too busy when writing your thoughts ... I hope you'll think twice before posting messages like this in the future. I think your issues will probably get fixed in 18.1. I think when big changes are made such as streamlining versions the developers work from an installed version and the testing process isn't so stringent on the live version. The Mint team make some interesting decisions. Making one cinnamon version instead of 4 would be seen as a way to reduce testing overhead but then they decide to recompile and rebrand tools so that they work better on desktops other than gnome. This would add a big overhead. 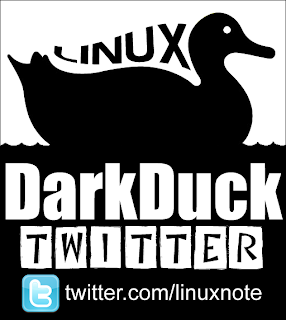 @darkduck : you think that it uses too much memory ? ON A LIVE SESSION ? After reading Dark Ducks responses to comments, I'm reminded of a quote from a movie. "It must be nice to know you're always the smartest person in the room." "No, it's awful." I won't be back to this domain. pretty pathetic review. Your weird and funky system and yor pathetic ego produced some weird and funky results. Nothin new here. Get a real system, read the release notes, learn what you are doing and try for some objectivity and a little less vanity and you may even gain some credibility. What a doofus! I tried Mint 18 and my hopes were high. Look and feel was nice, fast and had all the updated software I mostly used. Until I installed MythTV. What a total nightmare. For one, after the huge upgrade, everything for me went down hill fast. I found myself having to use the terminal 90% of the time just to fix all sorts of bugs and problems with getting my Laser printer and webcam to work. Where do I start? MythTV! After installing, My FusionHDTV 5 TV card no longer was recognized under Kernel 4.4.1 - After debugging this issue for an hour, the search for TV channels was so slow, taking almost 20 minutes to find channels. Then after all that, no TV channels found. SO I updated MythTV to version 29 beta and even worse. Now my HDTV card was no longer detectable. After two days of trying to fix these problems, I gave up and tried "Motion" for Linux. I wanted to turn my 1080p webcam into a security camera like I have been doing in Mint 17.3 - Well after installing in Mint 18 and configuring the Motion script. Everything went down hill fast. Video was slow and laggy, everything animated and the compression was utter garbage. On a high end IP camera I also own that uses a Sony 8 megapixel camera, video looked like a analog webcam on it's last leg. Lets also talk about battery life. For me, very bad. Ubuntu Mate had better battery life compared to Linux Mint 18. After two days of testing, it's totally failed me. I deleted it and went back to Mint 17.3 using default Kernel 3.19.0-32-generic x86_64 - for my MythTV and Security camera applications. I'm sorry too. I personally think after reading all the complaints and bug reports on Mint 18, is that maybe it was released way to early? I don't know. Only time will tell in the next release and I'll try again. guys stop criticizing the author, he just shared his experience with the distro. I too like mint 18 but this doesn't mean that i will not hear any criticism. Thanks William. You're right, this is my way of doing reviews, and I do them this way. Other person's opinion can be different. I recently installed Linux Mint 18.0 Cinnamon Edition precisely because version 17.3 suffered from video streaming flickering problems which don't exist in 18.0. No testing, just a straight install. Problems during install? Perhaps, except that the final result is that Multi Media video in both FLASH and HTML5 players play perfectly. That is a good result for you, John! Interesting John that you had video flickering in 17.3 and now not in 18. I upgraded from 17.3 to 18.1 for the same reason. Flickering is worse in 18.1 using Totem and VLC (both unusable), tolerable for a while in MPV. 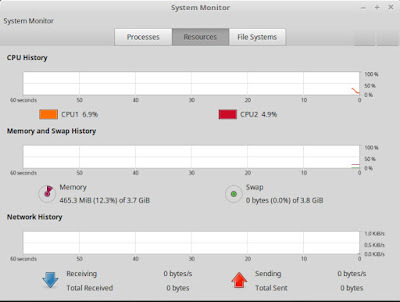 I have a powerfull Dell lappy with 16GB Ram, it shouldn't be an issue. Video was fine in 17.0 so what's happened? I should say the above is using the Intel GPU. If I switch in the nvideo GPU with latest drivers, it's unusable. Video playback is the only issue I have with Mint. Unfortunately I occasionally edit videos, so really hoping this gets fixed ASAP. 18.1 looks and feels "Mint stable" out of the box but after a few minutes I found crashing from Package Manager and various other apps to be notable. The VLC preinstall seems to take care of the codec issue. Hopefully they can improve on the next few point releases and iron out some of this wonkiness that is uncommon w/ Mint. I haven't tried 18.1 yet, but I agree that usually Mint is more stable. I never had an issue like this... I used one of the following but I use mint 18 Sarah 18.1 had a few issues. or from the main menu, by clicking on “Start Menu” >> ”Sound and Video” >> ”Install Multimedia Codecs” or during the installation process, by clicking a checkbox option. I play play MPV movies with SMplayer. I fine it produces a better picture lighting than VLC. if I play them on my laptop. I never like Totem. VlC I use to play DVD's only. Nvidia driver used in mint has always had issues with certain graphics cards with Nivdia. 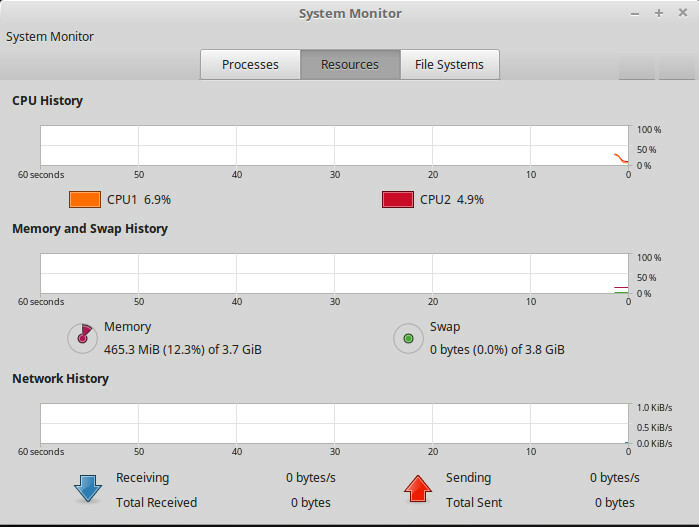 My mint desktop has a radeon 5570 was installed with out an issue. The driver used was radeon. mint 17 and mint 18 have different versions numbers of the cinnamon desktop or mate which ever you are using. IF your dell has a duel graphics card built-in I would change it to intel only. even IBM T500 series has this issue. mine does not have the duel so I am lucky. Flickering screen... main reason if you play video and use the web and then scroll the screen the Xserver will flicker due to it being 26 years old and patched like a patch pair of jeans to keep it functional. Currently apple computers use the same Xserver x11 or maybe even X12 not much better. If you are using a Intel 3000 chip search for an update from Intel's website. The good news is this Xserver is getting replaced. read this link Ubuntu has this in the 17.04 now and will be using it in Ubuntu 18.04. in April 2018 release. Thanks for you insight, Dave! Comparing Mint Cinnamon to Ubuntu MATE or Xbuntu isn't a fair comparison. Mint has MATE version, so that should have been used. Mint MATE deserves a separate review, but I have not done that yet. Maybe later. Or... do you want to write it yourself?